Every once in a while the Ubuntu User Days Developer Team offers classes for Ubuntu users where you can join a chat room and ask your Ubuntu questions. One of those days is (with little warning from yours truly) today. Although IRC is, to many, a rather antiquated tool, others find it incredibly helpful. So I thought it would be a good idea to write a tutorial on installing and using one of the tried and true Linux chat clients xchat. Although the tool is simple to install (and often installed by default), many have no idea how to use the tool. By the end of this tutorial you will. Take a look in your Applications > Internet menu. Do you see an entry for Xchat? If not fire up the Software installation tool you use (be it Synaptic, gnome-packagekit, or Ubuntu Software Center), run a search for "xchat" (no quotes), select xchat for installation, and click Apply to install. Once installed you should find the Xchat menu entry in the menu listed above. If, for some reason you do not find it there you can issue the command xchat to start the program. 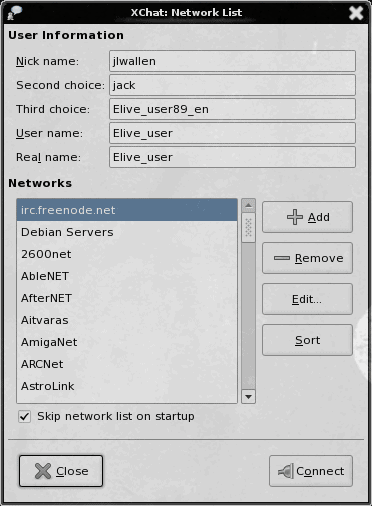 For the purposes of this tutorial, I am going to instruct you how to add the irc.freenode.net server. When you fire up Xchat click on Xchat > Network List. From this new window (see Figure 1) you will need to click on the Add button. When you do this a new listing will appear, under the Networks section, as New Network. Replace that with irc.freenode.net. Once that server is added, select it and click Edit. In this window (see Figure 2) you might want to add a favorite channel and, if you know you will always connect to this server, select it to Auto connect at startup. 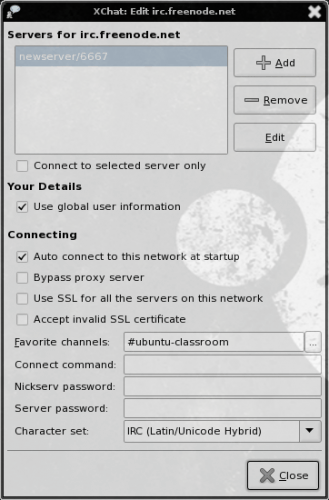 You can also add the command for joining your favorite classroom (for example /join #ubuntu-classroom. 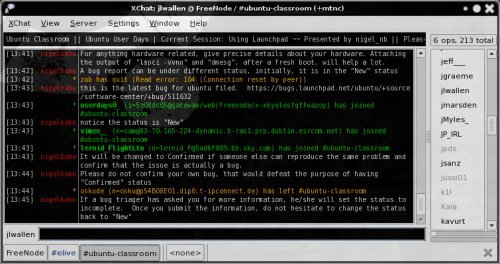 If you configure Xchat to automatically log into a server and to automatically join your favorite room (in this case #ubuntu-classroom) you can get into that classroom as soon as Xchat starts up. That is really the only options you need bother with for now. Go ahead and close this window and go back to the main Network List window (Figure 1). I suggest adding your nick name under the User Information section. Add a couple of choices, but we are going to now register a username on the irc.freenode.net server. By doing this you can ensure that no one on this server will be able to spoof your username. Go back to the main Xchat window (see Figure 3) and enter the command /server irc.freenode.net. NOTE: What you are seeing in Figure 3 is a live chat. You won't see this dialog until you are actually logged into a room. The first thing you need to do now is to choose a nickname (username). Once you have chosen your nickname enter the command /nickname NICKNAME (Where NICKNAME is the actual nickname you want). You have temporarily changed to that nickname. Now you need to send a message to the server to register your nickname. Do this with the command /msg nickserv register PASSWORD EMAIL_ADDRESS (Where PASSWORD is the password you will use for your nickname and EMAIL_ADDRESS is the address the registration instructions will be sent to. Where NICKNAME is the nickname you chose and fkibvcovlllo is a random string sent to you as a registration code. Where PASSWORD is your registered nickname. You will issue this command AFTER you have connected to your server. If you have never used an IRC chat application you will be surprised how handy they are. If you can find a good "classroom" to join (such as the #ubuntu-classroom) you will discover some outstanding resources for support. Too bad for me that I use ChatZilla extension for Firefox when it comes to IRC… probably because my Ubuntu machine currently cannot do internet (no lan connection going to my room, and it does not have a wireless card yet). Btw, the only reason my laptop solo-boots Windows XP is due to the video game compatability support.